In 1929, following an article in the Daily Mail about Britain's disappearing windmills, the Society for the Protection of Ancient Buildings (SPAB) launched a campaign to survey and protect England's windmills. The work was led by pioneering mill expert Rex Wailes, and soon became separate Windmill Section of the SPAB. In 1946 this became the Wind and Watermill Section, later referred to simply as the Mills Section. It still continues working to save England's historic mills today. From the beginning of the SPAB's attempt to survey English windmills in 1929, records were kept of mills across England, and these continued to be added to over the decades. They were supplemented by the personal collections of mill enthusiasts who left their material to the Section. The lack of space and expertise for dealing with this ever growing collection of archives was one of the main factors which prompted the establishment of the Mills Archive, and the SPAB was a supporter from the beginning, the understanding being that their archival material would be transferred to the Mills Archive, becoming one of the four foundation collections. The bulk of the archives were transferred in February 2004. 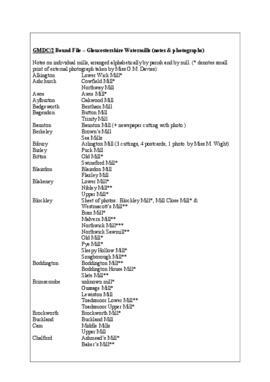 Where a set of material in the SPAB collection could be identified as having come originally from a named individual who donated their collection to the SPAB, this was treated as a separate collection in the Mills Archive catalogue (see list of related collections below). The remainder, consisting of records created by the Mills Section and miscellaneous items donated to the Section over the years, has been catalogued as the SPAB Mills Section Foundation Collection. The Mills Section's correspondence files were retained by the Section, although listed on the Archive catalogue. They were eventually transferred in October 2015. Records of the work of the SPAB Mills Section preserving windmills and watermills. Wind and watermill related items donated to the Society. Collection level description revised by Luke Bonwick and Nathanael Hodge, 2012; and by Nathanael Hodge, 2018. Whole collection catalogued to file level by Nathanael Hodge, 2018.